Click on the corresponding pictures for additional information. 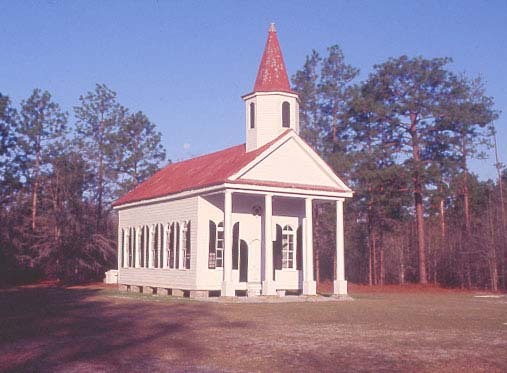 Stoney Creek Independent Presbyterian Chapel is located amongst a pine forest in the village of McPhersonville, on Hwy 68. It is the only pre-Civil War structure remaining in the area. Constructed in 1833, the Greek Revival chapel boasts four Doric columns supporting a pediment roof. The chapel was spared during the Civil War because it acted as a hospital, while the grounds were used as a campsite by Federal troops. Services are no longer held here. This chapel was listed on the National Register of Historic Places in 2002. This plantation house was originally built in the 1700’s as part of an original King’s Grant. The plantation contained thousands of acres, producing Sea Island cotton and rice. The owner, John Frampton, served as a delegate in the 1860 South Carolina Convention, and as such was a signer of the Ordinance of Secession. After the family fled, General Lee’s Confederate troops built an earthwork gun emplacement to help protect the railroad located behind the house. These mounds can still be seen behind the house today. Due to Frampton’s involvement in succession his plantation was targeted and burned during Sherman’s “March to the Sea”. Frampton, having fled the area, returned after the war with ample wealth to rebuild his home and continue farming. The house has been refurbished and is in use today as the Lowcountry Visitor Center and Museum. Picnic under 250 year old live oak trees that are dripping with Spanish moss. Frampton Plantation has picnic facilities including tables and trash cans. The plantation has restrooms, ample parking for campers and a dog walking area. After lunch come inside and browse through the museum and visitor’s center. Built in the 1750’5, the church was burned in 1779 by British Troops. The church was rebuilt from the remaining walls in 1826. During Sherman’s famous “March to the Sea” in 1865, Union forces burned the church again. Although the brick walls and columns failed to surrender a second time, the church was never to be repaired again. 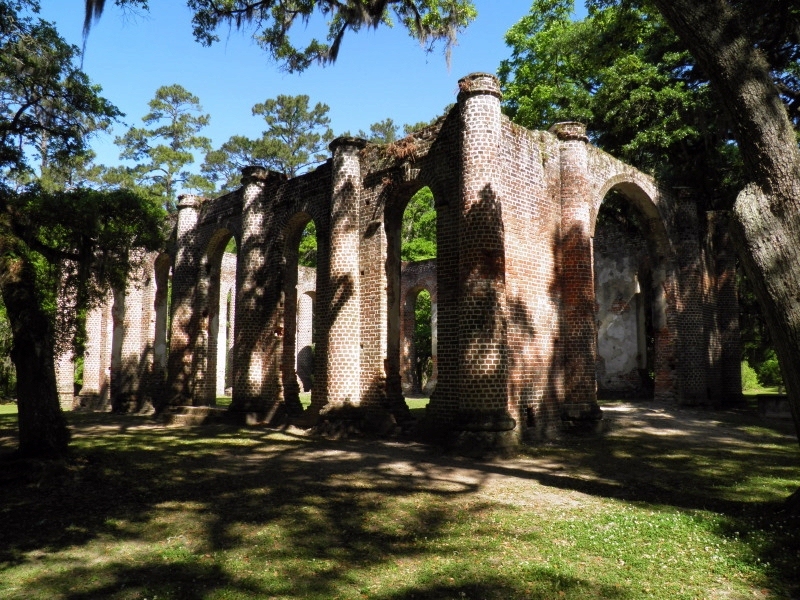 The ruins stand today among live oak trees as a reminder of the Lowcountry past. Pick up trail guide. 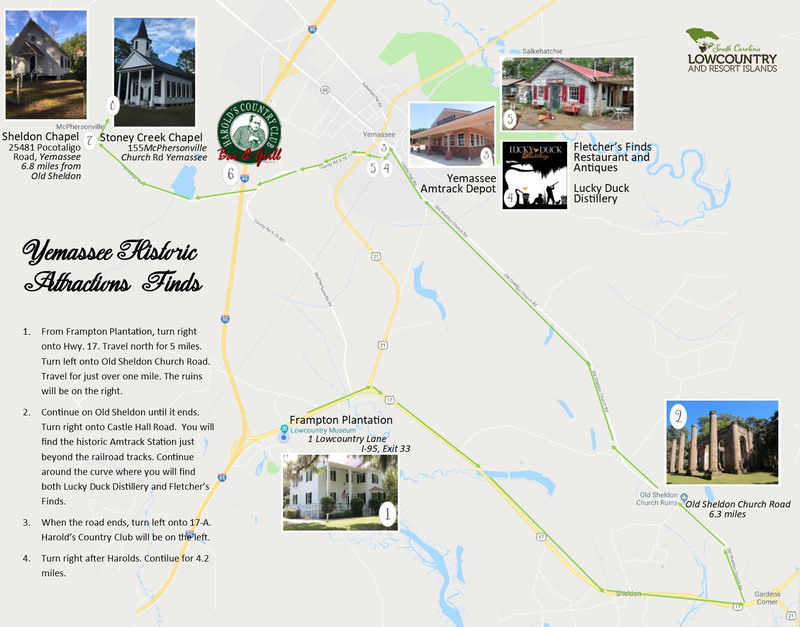 Phase One of this 22.5 mile trail covers the scenic Lowcountry counties of Beaufort, Colleton, Hampton and Jasper. The trail retraces the footsteps of soldiers fighting in the American Revolution and takes visitors to battle locations. 2. Follow guide and explore the other Revolutionary sites in the area. 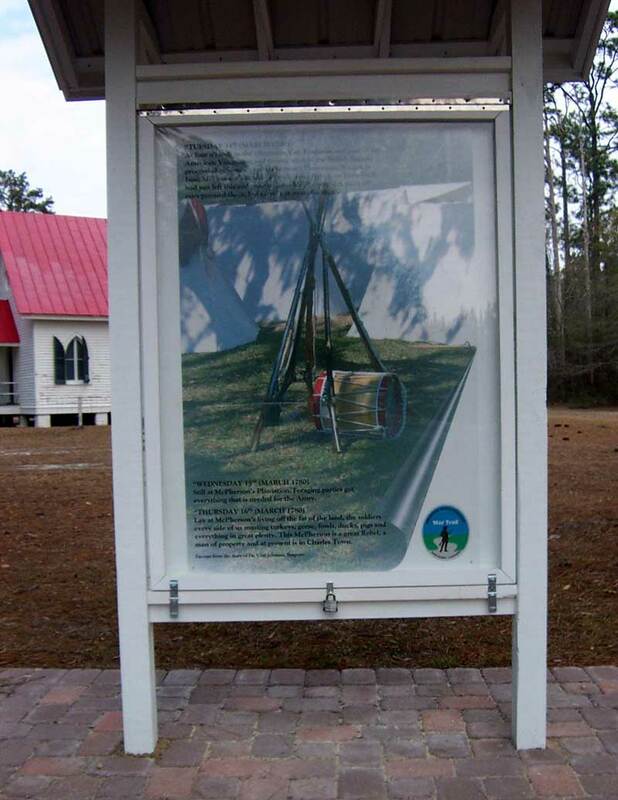 Visitors will be taken to the site of the Battle of Coosawhatchie, McPherson’s Plantation, the Skirmish at Saltketcher’s (now Salkahatchie) Bridge and Ft Balfour. Follow the Patriot War Trail logo and enjoy the scenic lowcountry.